Home → News → Highway Safety → City Hall - Stop Lying and Put Our Kids Safety 1st! 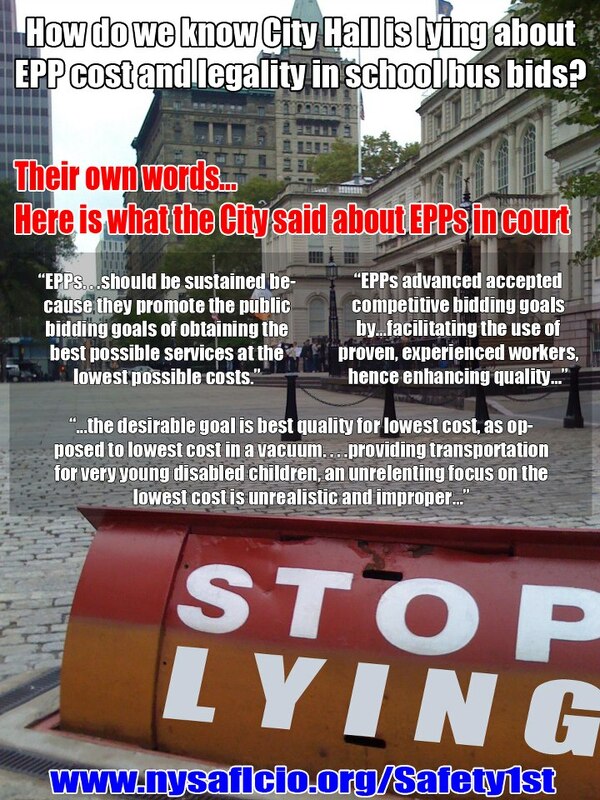 City Hall - Stop Lying and Put Our Kids Safety 1st! •The EPP guarantees experienced school bus crews are behind the wheel of your child’s school bus. •The EPP is not illegal. The City is hiding behind an unrelated Court of Appeals decision that does not apply to special education children. There has never been a court decision that has decided the legality of the use of the EPP when addressing the needs of special education children, and general education children. ATU Local 1181 supports a competitive bidding process. In fact, we welcome it, but we urge Mayor Bloomberg and Chancellor Walcott to consider the safety of New York City school children by recognizing the importance of the EPP, and the safe experienced work force it creates.